Did you know that according to the 2012 USDA Agricultural Census, there are around 6,800 almond farms in California? Almost 75% of those farms are just 100 acres or less—most are under 50 acres. And even though California produces 100% of the U.S. almond supply and more than 70% of the almonds produced worldwide, 91% of California’s almond farms are family farms! Many of these are owned and operated by third- and fourth-generation farmers who live on their land and hope to pass it on to their children and grandchildren. Ben passed this love on to all his children. He and his sons still farm over five hundred acres and lease and custom farm hundreds more acres beyond that. His daughter Maisie Jane started her own almond products company 25 years ago. She and her husband Isidro farm their own almonds, as well as purchasing from her dad, and together they experience the joy of being able to bring their crops straight to the consumer in a variety of forms under the Maisie Jane’s California Sunshine brand. Today the family tradition continues on. Visit Maisie Jane’s Country Store at 1324 Dayton Road in Chico and you’re likely to meet one of her three daughters along with their grandmother or aunt helping behind the counter or putting products on the shelves. 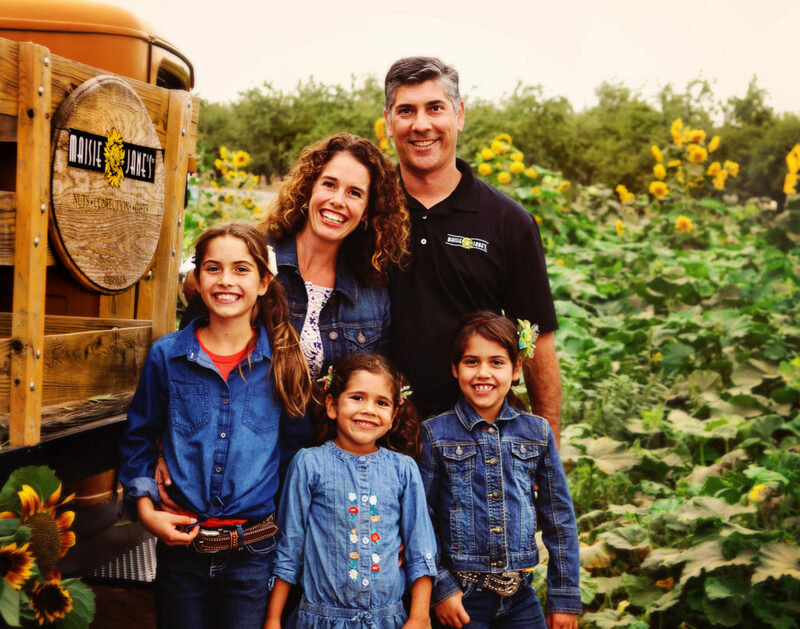 We think family farming is part of what makes this community special so Maisie Jane’s is committed to supporting other family farmers in the area, too. Many of the products we sell include ingredients sourced in the local region, and if you buy one of our gift baskets or visit the country store you’ll find products made by many others. Thank you for supporting family farmers! And thank you for supporting Maisie Jane’s.